Granite kitchen countertops from Stonecrafters are the perfect solution for your next home renovation or new build. Granite counter tops provide unmatched beauty and durability that can withstand the most extensive use. Granite countertops are available in durable tiles or a slab. The price of a slab can vary greatly depending on factors including quality, thickness, countertop design, and size. 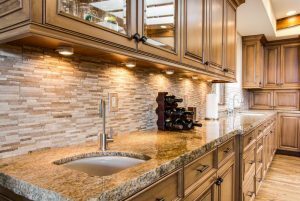 Let the experts of Stonecrafters near Cary provide you with an easy, accurate and no-cost estimate for your new granite kitchen countertops today! Serving Cary and the surrounding area are the premier granite counter tops installation services of Stonecrafters. The affluent communities of Cary understand quality products, and they depend on Stonecrafters to provide the highest quality materials for every granite kitchen countertop that enhances the value of their homes. In McHenry County, Illinois, Cary is an affluent village with nearly 18,000 residents who value quality and education with a 90% high school completion rate, and nearly 50% with a college degree. Stonecrafters are a highly rated granite countertops provider and installation specialist near Cary. We have been serving the community for over 20 years and have built an outstanding reputation on our values of quality, integrity, and exceptional service. Come see why we are the preferred granite counter tops fabricator in the greater Chicagoland area. Stonecrafters use only the highest quality stone for our granite kitchen countertops, so you know you will get the quality you deserve at the value that is right for you! Call Stonecrafters today at (815) 363-8730 for a free quote!